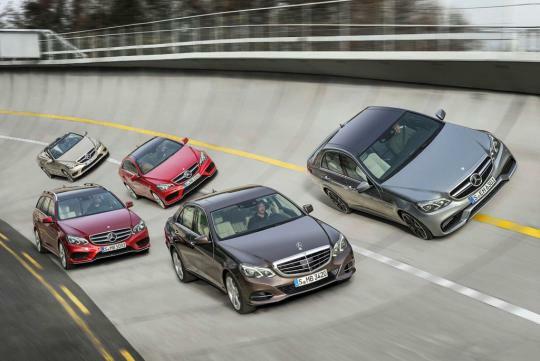 After much anticipation and speculation, the 2014 Mercedes E 63 AMG has finally show its face in an official photo alongside with its lesser brethrens that include the sedan, wagon, coupe and convertible variants. The hottest version of the E-Class range is expected to be powered by the existing 5.5-litre V8 twin-turbo which is good for 518bhp and 699Nm of torque. A performance package is available which pumps up the engine to 550bhp and 799Nm of torque. 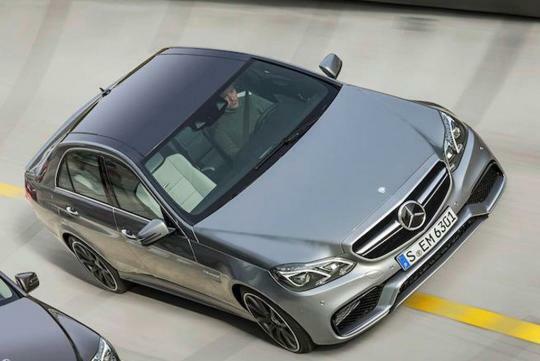 The E 63 AMG will be presented at the upcoming Detroit Motor Show. A statement from Mercedes reads, "Not only will we introduce the E-Class Saloon, Estate, Coupe and Cabriolet, but also the E 63 AMG model, now available in a 4MATIC version and, of course, the new four-door coupe, the CLA." 4Matic is the name of an AWD four-wheel drive system developed and used by Mercedes-Benz. Like the regular E-Class saloon, the E 63 AMG has a re-designed single headlamp unit. However, it sports a more aggressive front bumper that houses huge air intakes on both sides.